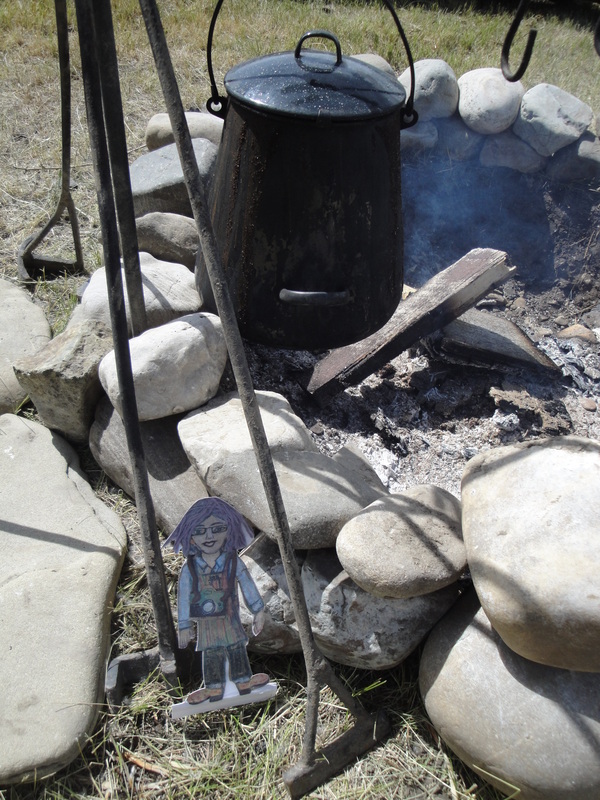 Flat Ruthie came with me to Alberta and enjoyed helping me with research for my next book. She also met my family there. She fit right in! Flat Ruthie hitched a ride to Alberta where she visited the Bar U Ranch outside of Calgary. She enjoyed her chuckwagon ride and was careful not to fall off. To a little too close to the fire! She also got close to some scary dinosaurs at The Royal Tyrrell Museum in Drumheller. The dinosaurs outside the museum were not quite as scary. Flat Ruthie looks so small beside this real dinosaur foot. If it stepped on her, she would be even flatter!! This entry was posted in Flat Ruthie’s visit and tagged Alberta, BarU Ranch, Calgary, dinosaurs, Drumheller, Flat Ruthie, Royal Tyrrell Museum. Bookmark the permalink.